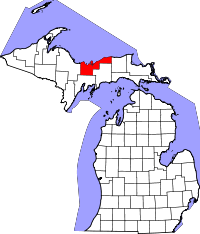 Alger County, which borders Lake Superior, has a dedicated Genealogy Research Department in the County Clerk's office. It allows research from 8:00AM until 4:00PM with a maximum of three researchers at a time, due to space restrictions. Birth and death records are available through the department from 1884 to the present, and marriage records from 1887 to the present. Certified copies of all records are $5, with $2 for additional copies. The Genealogy Research Department is located on 101 Court Street, in Munising, MI., and they can be reached by phone at (906) 387-2076. Alger County is home to the Pictured Rocks National Lakeshore, a 42 mile long waterfront area that stretches along the coast of Lake Superior. The park is named for the color rich sandstone cliffs which reach as high as 200 feet above sea level and are located not far from the county seat of Munising.